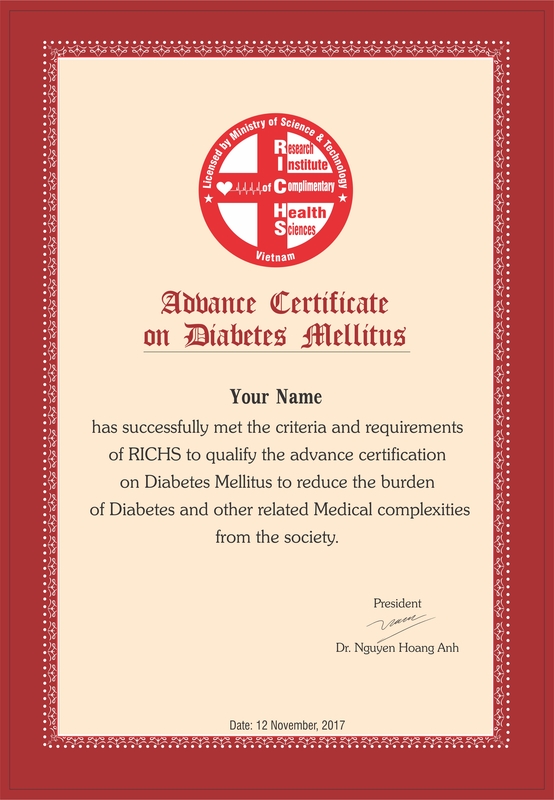 NOTE : Research Institute of Complimentary Health Science (RICHS) can be pursued only by those who are Certified Diabetes Educator from Indo-Vietnam Medical Board. 1) Research in the field of “Food as Medicine” to cure life style diseases . 2) Training Health Professionals, so as to create Certified Diabetes Educators not only in Vietnam, but also in nearby countries. 3) Identifying, honoring and awarding the health care professionals/organizations who are doing worthwhile work to reduce the burden of lifestyle diseases from the society. 4) Integrating the modern medicine with ancient wisdom to create a holistic health care system . 5) Educating the patients by means of publishing books, conducting training programs and online activities to make them more self-reliant and achieve better health. Dr. Biswaroop Roy Chowdhury is appointed as a member of the ‘Advisory Committee’ with the goal to lower the burden of Diabetes and other related Medical Conditions from the society . Advance Training & Certification by RICHS will be completed in six steps. Step-5 : Submission of two testimonials(handled by you after qualifying Diabetes Educator’s Certification Training) along with Answer Sheet . Step-6 : Declaration of the result through email. Dispatching of the RICHS certificate, after 30-35 days of declaration of the result. 2) Your Full Name as you want in your certificate . 1. You may pay online here. 34/5 Trần Khánh Dư St., Tân Định W., Dist. 1, HCM City, Vietnam.